Will Sam Bradford Be a Bust? An Open Forum. Arm Test: Probably my biggest concern. Though I can frequently be wrong about this, my general stance is there are a lot more quarterbacks in the league with good arms than there are with noodle arms. The poster boy for the bust with the arm is and will always be Jeff George. If you could convince people George was 22, and he ran through Bradford’s workout today, he’d probably be going in the top-5 picks next month. That’s all I’m saying. You don’t need a huge arm to play in the NFL, Drew Brees doesn’t throw lasers, but a weak arm in my book is equivalent of a guy being 5’11”. Face Test: Some guys look the part. Brady Quinn failed the face test. Cade McNown? Fail. This is not a fool-proof plan either. Take a look at Eli Manning. Complete fail on the face test, and he turned out to be a good quarterback. Romo doesn’t score too high on the face test either. Mark Sanchez, we’re going to wait and see. The hardest thing to do is differentiating between pretty boy confidence and straight-up asshattery. Take a guy like Brady, Matt Ryan maybe, and you can’t deny that these are some clean-cut pretty boys. But, they don’t crossover the idiot threshold where you find guys like Matt Leinart, Brady Quinn and where I assume you’ll eventually find Jimmy Claussen. Who’s Going to Draft Them: I think this makes a difference. The Browns shouldn’t draft quarterbacks. The Redskins haven’t done so well. I’m a little concerned about the Rams. This isn’t going to be a good situation in the first year, no matter if Bradford is good or not. Look at what happened to Matt Stafford this season. Was an entire year taken off his career with the beating he took this season? I guess I just wonder if someone like Aaron Rodgers ended up in Washington instead of Jason Campbell…would their careers be in similar spots to where they are now? I think you have to take into account the beating a guy is going to take, the likelihood the team is going to a 2-14 walloping, things like that. That’s about it for me. I like some things about Bradford. He probably passes the arm test and fails the face test. If he goes to St. Louis, that’s an uphill battle. We’ll see. What do you think? Coming to Terms with Moyer. Moyer Shows off the Grip of his Medium Ball. It happened Friday night. The night that will go down as the moment Jamie Moyer kicked Kyle Kendrick out of the Phillies starting rotation. I had my hopes up. Moyer traveling to face a team of Yankee starters. The planets seemed to be aligning. Moyer would get shelled. I’d get the peace of mind that comes with not having to watch the grand old man pitch every fifth day. Only problem was, the Yankees couldn’t touch him. Six and two-thirds innings, six strikeouts, not a run to be seen. For the guy who had the inside track on the job all along, it was more than enough. Barring an injury, Moyer will be in the rotation to start the season. Kendrick will take root in the question riddled bullpen. I’ve ridden Moyer harder than anyone here. It’s not that I think he’s a bad guy, or that I want him to fail, but I just don’t trust him. Honestly, he could go out and win 15 games, and I still wouldn’t want him pitching in the playoffs. Maybe that’s just me. But, it’s the truth. It was about a year ago at this time, one of the first posts I ever made on this blog, if not the very first, I predicted Moyer wouldn’t last in the 2009 rotation. I believe I said he was starting a smooth transition to pitching coach. Well, he didn’t last in the rotation. The run support gods allowed him to have a decent record, but his ERA was grisly. When Pedro showed up, Moyer was supposed to be out of our hair. But, you can’t get rid of this guy. I don’t see any reason to think Moyer will be better in 2010 than he was last year. I’m sure there will be starts where he has young teams confused and nine miles out in front of everything. There are also going to be starts where he gets absolutely shelled. I promise you that. More than his fair share. But, this is the position the Phillies have put themselves in, and I guess we have to deal with it. 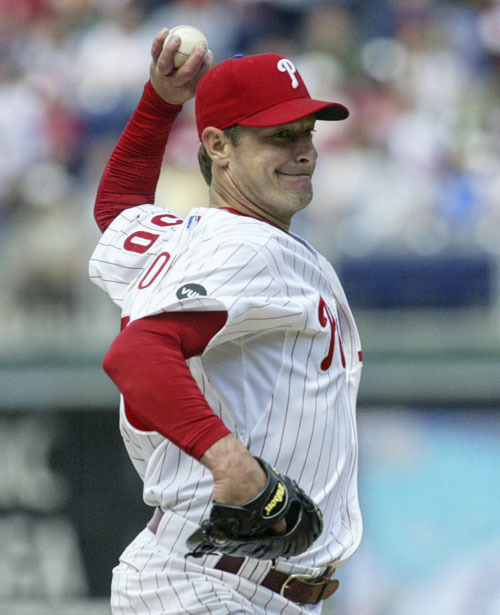 Jamie Moyer, despite his experience, is about the least versatile pitcher in the Major Leagues. He adds very little value to the bullpen, other than his lucky stretch as a rain-delay reliever in 2009. He’s not a strikeout pitcher, he can’t pitch two days in a row, he’s making 8 million, it takes him an eternity to warm-up. Sounds like a starter to me. And, so he’ll start. For now. Is this the lineup that gives the Phillies the best chance to win? I’m not sure. Would they be better with Kendrick in the rotation and a different relief pitcher in the bullpen? I think they very well could be, but they’re strapped to the contract and to the supposed sense of loyalty. There’s nothing left to do at this point. Sarcasm, jinxes, they didn’t work. Moyer survived. We’ll see how it goes. I just hope the Phillies are smart enough to use a short leash.